In the Rena River, caddis pupae hatch in enormous numbers and often make their way across the currents at high speeds. The trout take them really hard, so the fishing is action-packed from start to finish. The Foamblingpupa often yields great results. I always start with a few dead-drift casts with the pattern. If that tactic does not work, I speed the fly up by lifting and vibrating the rod tip. As caddis pupae migrate toward shore, their motions are usually erratic, with lots of stops and starts. Imitating that kind of movement greatly increases the chance of success. George, buy a copy of the magazine for page 124. Thanks. IT’S NOT PROBLEM TO BUY CONSIDERING MONEY BUT THE QUESTION IS WHERE AND HOW FOR US WHICH ARE NOT “BORN IN THE USA”! I have tied numerous times to subscribe to Hatches without success because the system will not validate my account card, although I deal with a number of other companies in the USA & PayPal with the same card. I have suggested paying by cheque (us check) to no avail, but I will keep trying! Regards Ian Paltridge Australia. Well it looks like a good magazine, however after 2 months of waiting for a paid order with no reply’s to my emails, I am ticked off with them. I would have been just as happy with a PDF file subscription, and they could send it out next day, including the back issues. It take a lot of effort to produce a magazine and I appreciate that, but this day and age with printers available, I think that a PDF would be a great option. The ads would still be shown and export customers could still receive their purchase on time, makes for things like contests more fun. As weeks of waiting for my back orders I cannot give high marks for the magazine. 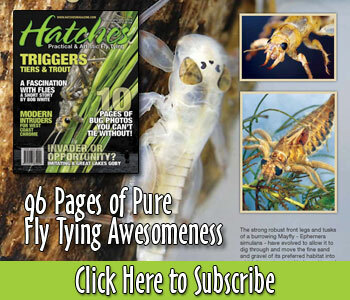 I have also had trouble here in the US trying to get magazine, not sure what the problem is, I have tried several times to get subscription, but still have not seen anything in mail, or email, and would really like to try tying some of the flies I see on here. very upset.